Anyone else having problems with the tailgate rattling? Any suggestions for fixing the problem? I've not experienced any rattles in my 2015 (non motorized lift-gate), though I have noticed that the gate is very sensitive to anything in the way of closing and will not latch all of the way if even the rubber mat isn't carefully pushed all of the way in before trying to close it (which could lead to a rattle). Are you sure that it's fully latching? I just make a point of checking and sliding the rubber mat forward if it's not closed well. I haven't had any noise issues with the tailgate. I was directing my attention to it for a while since I use a clamp on bike rack, but no problems so far. Asked to answer: I have not had any tailgate rattling (or any rattling) in my 2015 Forester. Here's to solving that issue quickly, so you can get back to fully enjoying your Subie! I've had a few intermittant rattling issues from the roof area over the cargo area of my 2014 2.5i Limited Forester (with the powered rear gate). But only when I had the sunroof open. Taken to the local dealer and it was found that one of the cross beams was a litte out of alignment. When the roof was wide open, the beam and the sunroof would touch, causing the rattle. The dealer added some very - VERY - thin foam tape to the underside of the beam and also added some additional silicone adhesive/filler between the beam and the inner skin of the roof. No more rattle. This was the 2nd attempt to fix. The first was just adding the silicone filler/adhesive, which dried out after a while. Also, check your license plate and/or license plate frame. Ths can cause some of the rattling. Put a bit of insulation tape (from the local hardware store) on the back-side of your licence plate at the bottom (and the top?) to help keep the plate and frame from tap-tap-tapping on the rear gate. Also, take a look UNDER the rear floor of the cargo area - where the spare tire and such is located. Make sure none of the tools (or anything you may have stored in there) is rattling. 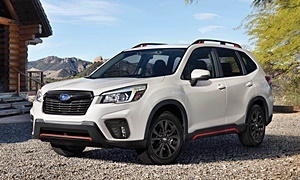 If all else fails, take your Forester back to the dealer and see what they can help you find.